ProMation Engineering Inc., a worldwide provider of electric motorized actuators for industrial use, has successfully completed a key milestone for international ventilation applications in rail and road tunnels and underground passenger platforms such as subway stations. In an emergency situation such a fire inside the structure, electric motor operated dampers in the ventilation system can act to suppress spreading of the fire as well as to clear smoke from the structure. Most motorized actuators that operate these dampers are required to be "failsafe", where they are equipped with mechanical springs that close (or open) the damper upon loss of power at the actuator. Further, the motorized dampers must function at elevated temperatures to be effective. The ProMation PA series of spring return quarter turn, fail-safe electric actuators successfully performed a high temperature functional test, meeting standards and guidelines for the United States, United Kingdom, Austria, France, Switzerland, Sweden, Korea and the Netherlands. Not only did the actuators function after one hour at 482F (250C), they were fully operational after two hours at that temperature, a more severe test required more frequently as standards evolve. The test actuators, a PA spring return unit with 450 in lbs (50 Nm) of torque and a PDO spring return unit with 2300 in lbs (260 Nm) of torque and equipped with a manual override mechanism were placed in an oven preheated to 482F (250C). The actuators were outfitted with specially designed thermal protection. 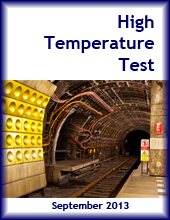 Sensors monitored the temperature at various locations throughout the test. Once at temperature, the actuators were tested at 30, 60 and 120 minutes. The actuators were fully functional during the tests. Without the thermal protection, normal operating temperature for the spring return actuators is -20 to 150F (-15 to 65C). After testing, both units were disassembled and inspected. While there was discoloration in places on the outside of the thermal layer; there was no observable damage to the internal components. Both test units met their operating specifications for cycle time, electronic operation and repeatability. For more information, call 352-544-8436, Fax: 352-544-8439, E-mail: sales@promationei.com, browse this site, or write ProMation Engineering, 16138 Flight Path Drive, Brooksville, FL 34604.